There’s nothing better than spending time with family, especially with the holidays just around the corner. But with the kids out of school, a calendar full of plans and a group of different ages and interests, keeping everyone entertained can be a challenge. If you find yourself in Orlando, however, it doesn’t have to be. The City Beautiful is full of attractions and activities to suit every taste and accommodate every group—even after you’ve left our world-class theme parks. Have a beach bash. Any native Floridian will tell you summer doesn’t go away; it just gets a little cooler. And when you think of Florida, who doesn’t think of the beach? A group gathering ocean-side is always a blast and can keep everyone happy, whether they want to relax with a book, surf the waves or build a sandcastle. Orlando is only a short drive from great Atlantic beaches like New Smyrna Beach or gorgeous Gulf Coast beaches like Clearwater—so be sure to make some family memories together. Get outside. They don’t call it the Sunshine State for nothing. Florida has great weather year-round, and it’s always an awesome time to get outside. Take a stroll through Leu Gardens or Bok Tower Gardens, hike a nature trail, or canoe down a natural spring like at Wekiva Springs State Park. Around the holidays, you can often see some festive décor at one of the many parks in the area, like at Lake Eola downtown or at Cranes Roost in Altamonte Springs. There’s nothing like getting back to nature to bring the family together. Visit a museum. From the Orlando Museum of Art or Mennello Museum of American Art to the Orlando Science Center, there are plenty of places the family can learn and explore together in Central Florida. Exhibits are always changing to suit all tastes, and there are even plenty of activities for the kids. Fly high at Orlando Tree Trek. 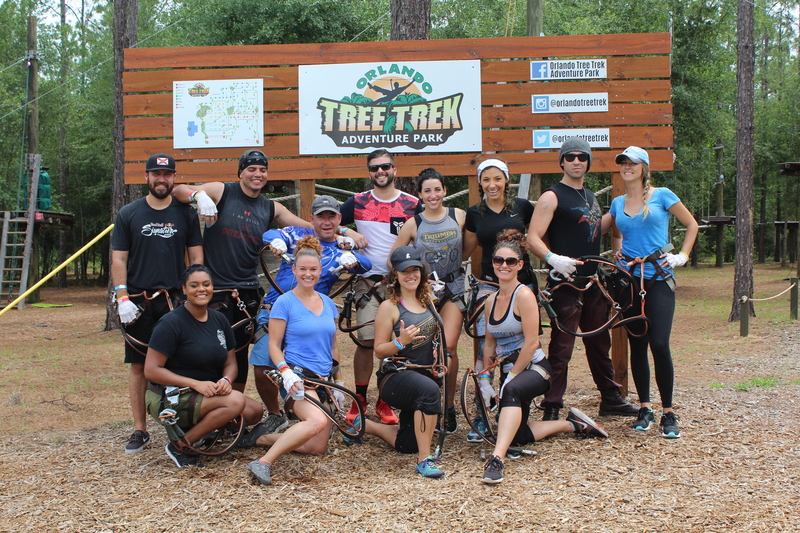 Zip lining in Florida is one way to really bring the whole family together with an adventure they’ll never forget—and it’s no secret that Orlando Tree Trek is the best place to zipline Orlando. With both adventure park ziplines and multiple obstacle courses for many ages and experience levels, there’s something for everyone. The whole family can work together and encourage each other as they take on the tree to tree adventure park—not to mention the awesome photo opps available high up in the trees as you take on the ropes course! Around the holidays, our rope park is also an amazing way to get everyone out of the house and active to burn off any extra holiday treats. Whether you’re looking for a simple beach blast or an exciting way to zipline Florida, Orlando offers plenty of great ways to spend some time together as a family. Around the holidays, that’s even more important. If we can help you set up a family adventure together, give Tree Trek a call at 407-390-9999.